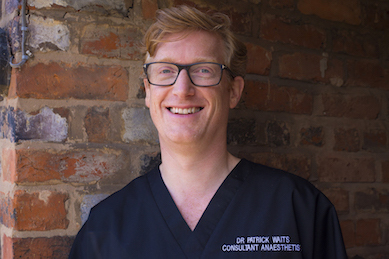 Dr Patrick Waits works with Dr Richard Brookshaw and the implant team to provide conscious sedation for our surgical patients, which is one of the areas of his specialist expertise. Dr Waits graduated from the University of Newcastle Upon Tyne in 1999. His Anaesthetic training was undertaken in the Nottingham & East Midlands training scheme, a highly competitive training program well known for its excellent training reputation. During his registrar years, he undertook time as a research fellow, developing an interest in major haemorrhage and undergraduate education. Patrick was appointed as a Consultant to Pennine Acute Hospitals NHS Trust in September 2010. In addition, he contributes to Health Care Reform for Greater Manchester and Undergraduate Education (Honorary Senior Lecturer, University of Manchester Medical School). His clinical work also involves anaesthesia for a wide range of both adult and paediatric patients, using both general and regional anaesthetic techniques.